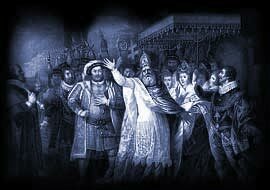 Many believe Henry VIII to be Shakespeare's last play, but others firmly believe that the Bard had little, if anything, to do with its creation. Queen Katherine of Aragon is upright and virtuous and married to King Henry VIII. Henry was a proud and wilful monarch who defies Rome's ban on divorce to marry Ann Bullen (Boleyn). Cardinal Wolsey the Powerful Lord Chancellor of England and accomplished politician attempts to bend Rome to the king's wishes in the Bullen matter. Later, near death, he repents his unpriestly activity. Katherine is divorced and sent to Kimbolton Castle and Anne marries King Henry VIII to become his queen. there was a huge demand for new entertainment and Henry VIII would have been produced immediately following the completion of the play. During Shakespeare's lifetime the play was also known as "All is True." however there is no evidence as to whether this was a subtitle or the original main title. The settings are England including London and Westminster. The number of spoken words in the script, according to the Complete Public Domain Text is 26,146. The quotes from Henry VIII include 'No man’s pie is freed from his ambitious finger' and 'Press not a falling man too far'. Details of these famous quotes follow, complete with information regarding the Act and the Scene, allowing a quick reference to the section of the play that these quotations can be found in. Please click here for the full text of the script of the play. "Press not a falling man too far!" (Act III, Scene II). The drama was based on the actual monarch of England and the turbulent events and people who were important in his life. The play concentrates on his first two wives, Katherine of Aragon and Anne Boleyn. The drama and characters in the story have inspired other works such as the movie, Anne of the Thousand Days the film Starring Richard Burton and TV Series, The Six Wives of Henry VIII, starring Keith Michell as Henry. And the classic film about King Henry VIII and his six wives starring Charles Laughton should also be remembered. The King has also been portrayed by the actors Robert Shaw and Charlton Heston. Click the link at the top of the page to access to a list of all the Cast and Characters of the play by William Shakespeare.